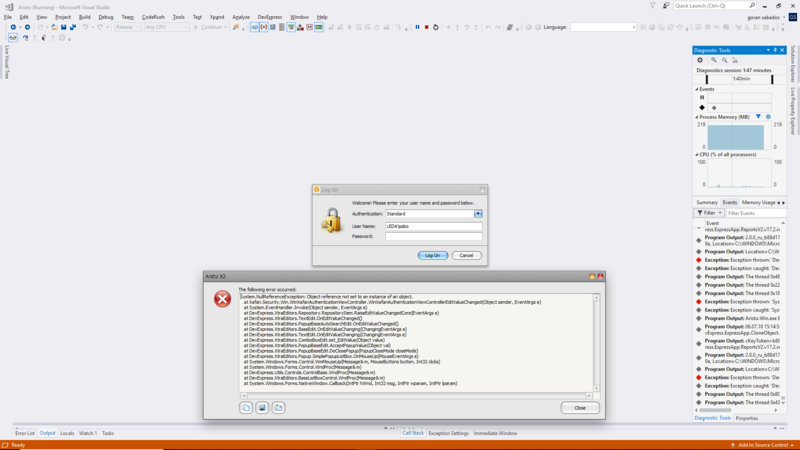 when I try to change authentication type from Standard to Windows (or reverse) I get this error. It started several weeks ago, before it worked normaly. In order to fix the issue, we must first reproduce the issue in our labs. We are unable to reproduce the issue with the steps you provided using the Xafari Demo, shipped with XAF. We do not have ideas why this error can occur on your machine either. I sent you original project because it produces this specific error. You just have to open it and change Authentication type from Standard to Windows. You receive an error message because you have deleted the "Remember Password" Layout View Item from "XafariAuthenticationLogonParameters" Detail View Layout node in the model editor. Reset the differences in the node to fix the error. At your request we will fix the problem on our side. All information is passed on to our development team. Also a relevant issue [102.185286] registered in our issue tracking system. You may reference to this number later to find out its state. I’m sorry for the delayed answer. We fixed this bug in the new build Xafari x11 18.1.4011.1510. You can download it from https://galaktika-soft.com/xafari/download.